Great sharp lens! I use it on my D3 all the time now. I purchased this lens brand new for twice the price as in the US, and it’s easily worth it. The build quality is unmatched by new lenses, even the best professional ones. The AIS version of this lens is spectacular. Someone said that it is the sharpest wide angle Nikon makes. I believe it! That along with the Nikkor 20MM F2.8 AIS. I use these two lenses to cover my wide angle needs. The R&L reviews give both of these lenses a 5. I've used the 24MM & 35MM combination together but I prefer the 28MM & 20MM combo the best. They seem to do the job. Nikon engineers did very, very well with their 8 element, 8 group design. Now, if they could only stop making plastic lenses!!! The build quality, Optical performance, CRC with 0.2ft min focusing distance. Smaller physical size compair to one stop faster f2. none I found for last 6years. Very versatile normal-wide angle lens. Now adays, 28 is not really a extreme wide angle anymore but about 6 years ago when I bought this lens as new, it blew my minds away with the optical performance and its 74° field of view. The contrasts and sharpness was amazing. I bought f2.0 first and it was also excellent lens but for a stop difference I couldnt pay for double of 2.8 which is great lens. I'm glad I got this. 28f2.8AIS with Tri-X 400 on my FM2n(before)FM3A(today) it is excellent tool for general/street photography. I still use this like my prime lens beside 45f2.8AIP. NIKON 35 f1.4, f2 AIS and AFD 28f2 briefly. Even sharp image at f2.8 Around f5.6 and above is perfect. I never seen this sharp wide angle lens from nikon with wide open apature. Has usual Nikon distortion which I think is normal. Excellent color and b/w rendertion. A Fantastic Lens! Small and Super Sharp. I've shot 10rolls of Velvia 50 so far with alot of black and white films, the results are fantastic. It was only available in new at B&H as gray market but I'm so glad I got this superb lens. Now it's my everyday lens on my FM3A. I love this lens!! 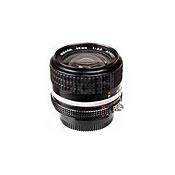 I got this one used.Excellent quility lense one of the best i have used! CRC (Close Rang Correction). Well built. Amazingly sharp! Outstanding wide angle lens! I had always heard this lens was the best of the Nikon wide's but you really don't know how good untill you try it. This is the lens Nikon should have based there AF version on. Not the "E" Series lens that they used instead. These are a steal on eBay but even at the new price they are worth every penny. All Nikkors...AF 24mm, AF 28mm, AF35mm, AF 18-35mm. Excellent sharpness, low distortions. Excellent build quality. A little bit sensitive to flare. Soft a infinity. Excellent lens in any respect (optical performance, build quality). Sharpness is phantastic at small distances, but goes a little soft at infinity. A little bit sensitive to flare when used without hood. Lubrication of helical screw needed after 4 years, since then perfect. Build quality, stunning optical quality, close focus, etc, etc! Can be found s/h at bargain prices. This lens has the reputation of being Nikon's sharpest wideangle lens and I have found that this reputation is wholly justified. The lens oozes quality from the moment you pick it up, everything works like you want it to and best of all... it can be found pretty cheaply! I remember seeing these for about £500 a few years ago, you can get them for £300 if you shop around (new). Close focussing with Nikon's CRC system gives great quality pictures. A "must have" for any Nikon outfit. This review applies only to the AiS version of this lens, the Ai lens is an older design with nowhere near the imaging qualities of this one. This is one of Nikon's best ever lens designs, but it does not recieve much notice as it is in the 'standard wideangle' category. Beyond SHARP, it is too sharp for portraits up close. It will focus very close, just under 8 inches **to the film plane**, with impressive results at all distances. I bought this lens after postive reviews read all over the 'net, and was not dissapointed in the least. Up until my recent purchase of an F5 body, it was my standard lens on my F4. There is still no comparison in the AF line to an AiS MF Nikkor in good shape: the focus has a liquid smooth feel to it, and the rest of the mechanics are rock solid. Works great with an HN-3 hood, even with a filter. This is the second sample of this lens I have owned, and it is the same as the first,GREAT.